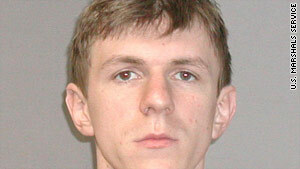 James O'Keefe is accused of entering the office under "false pretenses for the purpose of committing a felony." "On reflection," he said, "I could have used a different approach"
(CNN) -- Conservative activist James O'Keefe said Friday that the government had "confirmed" that he did not try to wiretap or bug the office of Sen. Mary Landrieu, D-Louisiana. He offered no evidence to back his assertion. O'Keefe, 25, Joseph Basel, 24, Robert Flanagan, 24, and Stan Dai, 24, were charged Tuesday with entering Landrieu's New Orleans office -- which is federal property -- under "false pretenses for the purpose of committing a felony," according to a news release from the local U.S. attorney's office. Calling himself an "investigative journalist," O'Keefe said he was trying to test the credibility of a claim by Landrieu that her office had been unable to field calls from constituents opposed to her stance on the Senate health care bill because her phone lines had been "jammed for weeks." Landrieu voted in favor of Senate Majority Leader Harry Reid's health care bill in December after receiving a promise of significant additional federal funding for her home state in a deal that critics labeled the "Louisiana purchase." "I decided to investigate why a representative of the people would be out of touch with her constituents for 'weeks' because her phones were broken," he said in a statement released on the conservative Web site biggovernment.com. "In investigating this matter, we decided to visit Sen. Landrieu's district office -- the people's office -- to ask the staff if their phones were working." O'Keefe said that the "sole intent" of his "investigation was to determine whether or not Sen. Landrieu was purposely trying to avoid constituents who were calling to register their views to her as their senator." "On reflection," he said, "I could have used a different approach ... particularly given the sensitivities that people understandably have about security in a federal building." O'Keefe said he had "taped the entire visit, the government has those tapes, and I'm eager for them to be released because they refute the false claims being repeated by much of the mainstream media." He also slammed various news organizations, including MSNBC and The Washington Post, for what he said was inaccurate coverage of the events surrounding his arrest. "The public will judge whether reporters who can't get their facts straight have the credibility to question my integrity as a journalist," he said. Basel and Flanagan attempted to gain access to Landrieu's office Monday while posing as telephone repairmen. The two men were "each dressed in blue denim pants, a blue work shirt, a light green fluorescent vest, a tool belt and a construction-style hard hat when they entered the Hale Boggs Federal Building," according to a news release from the local U.S. attorney's office. After they entered the building, the two men told a staffer in Landrieu's office they were telephone repairmen, according to the release and an affidavit from FBI Special Agent Steven Rayes. They then asked for -- and were granted -- access to the reception desk's phone system. O'Keefe, who had been waiting in the office before the pair arrived, recorded their actions with a cell phone, Rayes' affidavit said. Landrieu said Thursday that the four men had "embarrassed themselves and their families." In a statement released by her office, the Democratic senator also called claims by the men's lawyers that their clients were trying to embarrass her staff "a clear and calculated effort to divert attention away" from the crime itself. "The fact remains that they perpetrated a false identity scheme on building security by posing as telephone workers and attempting to manipulate the phone in her office," the statement said, saying those involved could face up to 10 years in prison for the federal crime. O'Keefe is the same conservative activist who dressed as a pimp last summer and visited an office of ACORN, which bills itself as an advocacy group for low- and middle-income families, to solicit advice on setting up a brothel, among other scenarios, law enforcement officials said. He secretly recorded the visits, and the videos were posted on the Internet, leading to a media firestorm.